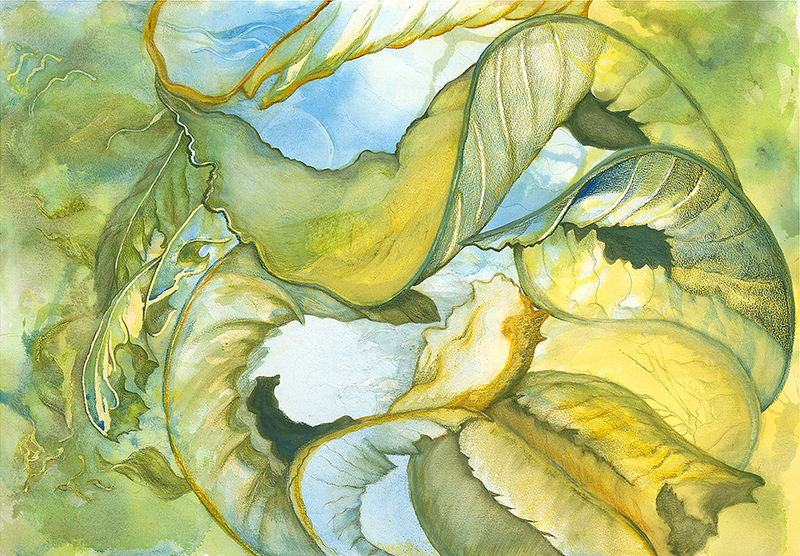 Through the use of color, transparency, and layering, my goal is to create lyrical and magical representations of the natural world, whether the subject is a humble group of leaves, a majestic mountain range or an endangered bird. I paint everyday elements of the natural world that I observe in my urban neighborhood, in a wilderness, or in tropical jungles, and work to capture their mystery, variation, and whimsicality. In the natural world I see endless contradictions within the same landscape: light/ dark; arid/ wet; living/ dying. I am compelled to examine this harmonious paradox in my work. I am transfixed by the complex tapestry of nature and its constant flux. My process reflects this fascination with the constant motion and spontaneity that is ever-present in the natural world. I begin a painting by developing the ground—spilling and in turns adding different colors of paint onto the paper. Though I manipulate the paint using various techniques, there is always an element of surprise and wildness. I strive to maintain this feeling of movement and spontaneity as I develop the painting to its finished state. I work with watercolor paints and pencils, ink, and charcoal on 260-300# cold press Arches watercolor paper. Born in New York City, I was raised in Berkeley, California. Over the years, I studied art at the University of California, Berkeley, the Academy of Art University in San Francisco, and Laney and Merritt Colleges in Oakland, California. To support myself, I devoted most of the last 25 years to a legal career, and began raising a family. I have now returned, however, to my original passion, drawing and painting.